Kepa’s made light of enormous price tag by impressing between the sticks for the Blues this season. Kepa Arrizabalaga, the world’s most expensive goalkeeper, has made a fine start to life at Chelsea, but it appears the Spaniard is lucky he’s not got to face compatriot Marcos Alonso in matches for the fullback has gotten the better of the custodian in Spain training with two consecutive free-kicks. Kepa was outstanding on the weekend for Chelsea as they beat Southampton 3-0, making several top-drawer saves to preserve his clean sheets and for now at least, it looks like Thibaut Courtois’ replacement has been found. The young Spaniard was a virtual unknown when the Blues shattered the transfer record to sign him for an eye-watering €80 million this August. In eight Premier League games, Kepa’s kept four clean sheets and has looked every bit a proper goalkeeper. Alonso’s widely considered one of the best set-piece takers in the English top-flight, so Kepa shouldn’t feel too bad about it. Spain, who had a disastrous World Cup campaign, now take on Wales (October 11) and England (October 15) in the ongoing international break before their players return to their respective clubs. While Kepa’s been excellent between the sticks, Alonso’s been terrific in his role as a fullback in a flat back-four, as opposed to the wing-back position he was utilised in during Antonio Conte’s era. 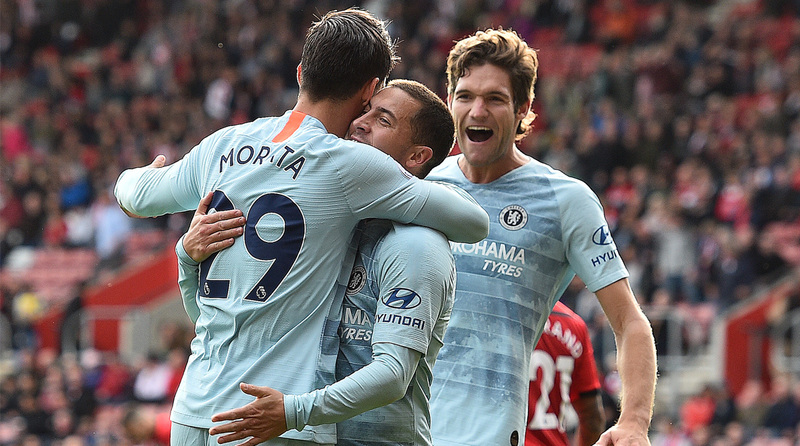 Under new coach Maurizio Sarri, Chelsea have not only remained unbeaten, but they have dominated their opponents and are sitting pretty at the top of the Premier League table. Defending champions Manchester City are first, but only due to a marginally superior goal difference as the second-ranked Blues, along with Liverpool, are level with them on 20 points each.